We provide high quality, customer-focused, mortgage, life protection and related services, to private and commercial clients. Our core business is to identify the most suitable mortgage, remortgage or protection products for our clients in a timely, cost-effective, and compliant manner. 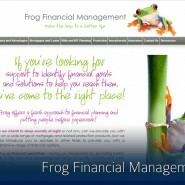 “I referred my daughter to Craig Scott of Frog Financial Management who was able to raise a very good mortgage for her. She was so pleased that she has referred several of her friends and work colleagues to Craig, who has gone on to providing a number of them with Mortgages”.